Finest Professional Cold Blue On The Market-Period! 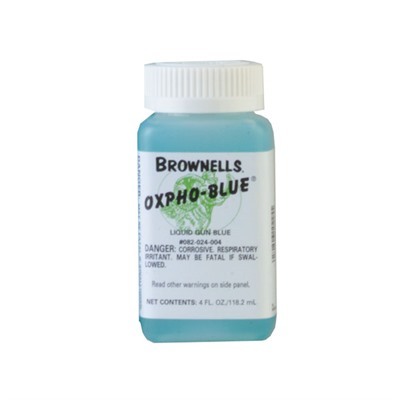 Originally developed for the occasional bluer who is not equipped to completely polish a gun prior to bluing, Oxpho Blue - because of its ease of application and remarkably superior results - has become a favorite of the professional gunsmith as well. 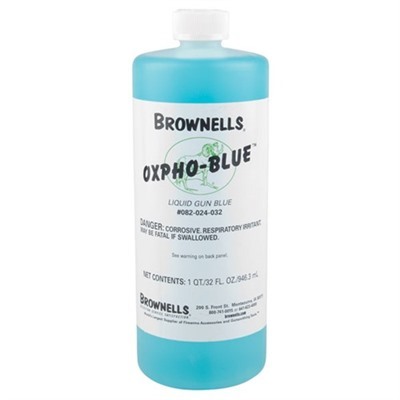 With Oxpho-Blue, all you need do in most cases, is dampen a piece of cotton flannel and give the area a good rubbing. The chemical goes through the oil on the gun, removes thin rust and blues the steel underneath. No after-rust. For looks, the final finish was not intended to approach the beauty of the well-polished, hot-blued gun. It has developed, however, that in the hands of a careful craftsman, not only is the Oxpho-Blue finish beautiful, but it is also more durable and weather resistant than any other known chemical finish. Phosphate-like surface forms under the blue. Rust removing qualities of the solution, making it unnecessary to remove mild rust in the usual manner. "Wetting" characteristics of the solution, giving it the ability to penetrate oil, dirt, etc., on the surface of the gun; blue the metal underneath; remove rust and dirt; leave the gun blued and ready for oiling. Beauty and high durability of the finish: vigorous rubbing with No. 0 steel wool is one of our favorite application methods - the more rubbing, the more brilliant it comes and, since abrasion is part of the process, normal contact from gun cases, brush and clothing won't wear your bluing. SPECS: 4 fl. oz. (118ml), or 32 fl. oz.